Counseling is a great investment in your future. We appreciate you taking the time to grow. Thank you for your interest in Boice Counseling. I love working with couples and helping them get better results. My preference is that you stay married if at all possible. If you've already decided to separate or divorce, I can help you do that with as little suffering as possible. Michelle is my Office Manager and does the screening for intake, insurance, schedules etc. Please call her at 544-5342 to set up counseling. Corner of Titus Avenue and Kiwanis Street. Parking lot off Kiwanis Street. Between Hudson and Seneca on the North side of Titus. Allstate has several large signs you cannot miss. I am in that building. Landmarks: Down the street from the House of Guitars (Titus- I am on the opposite side of the street- less than a half mile away). If you are driving East on Titus, you’ll see the Wegman's plaza on your right, Subway and a gas station you cannot take a left onto Kiwanis, there is a confusing “Do Not Enter” sign at one part of the triangle at Kiwanis Street. You cannot take an immediate left at that part of the triangle. The street itself is not a one way street, you just cannot enter making a left. Some people choose to make a left turn onto Curtice (which is one block before Kiwanis) – at the light, then a right onto Cambria and another right onto Kiwanis. Heading West on Titus: It is therefore easier to approach Kiwanis from the West. House of Guitars will be on your left and you will take a right onto Kiwanis Street about 20 feet after the point where Hudson and Titus intersect. At the corner of Titus and Kiwanis is a red house, turn right immediately after the red house. Then turn left into the parking lot – you will see an Exit sign first and then an Enter sign further down. If you are on Hudson, when you get to Titus, it is as if you will be going straight. Both lanes can turn left. 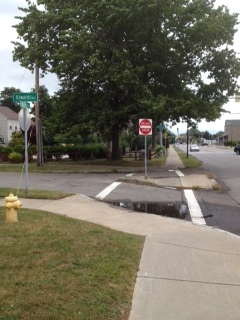 Note the red house directly in front of you when you reach the Hudson /Titus intersection. About 20 feet to the left of the red house is Kiwanis Street. That is us. Note the large Allstate sign on the brick building- that is my building. The parking lot is on Kiwanis Street. Come in the glass doors by the mailboxes and come downstairs. Note: There is only one entrance to the building. You will see glass doors, near mailboxes, the glass doors have large Allstate signs. That is the only entrance for my building. You have arrived. Come inside and down the stairs to the right. This is the angle from the parking lot. 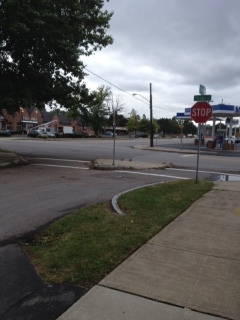 Note the concrete triangle to the left of the stop sign. The image below is heading East on Titus. The building is on your left and you clearly are not encouraged to take a left onto Kiwanis.